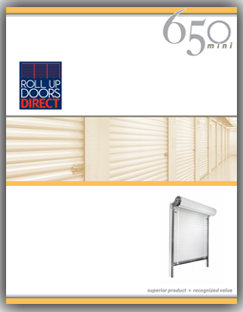 The Roll Up Doors Direct International Corporation Model 650 Mini Storage Door is designed and manufactured with durability, quick installation, ease of maintenance in mind. Standard features such as ratchet tensioner, enclosed barrel housing a dead axle assembly, and a factory installed stainless steel latch eliminate the need for upgrades and additional charges. This is not a Wind Load door. Up to 7'0" 7'1" to 8'0" 8'1" to 9'0" 9'1" to 10'0"
The Model 650 Mini Storage Door is designed and manufactured withdurability, quick installation and ease of maintenance in mind. Features standard to this door eliminate the need for extra options or upgrades. Time is money so you save money since we ship your self storage door with the latch, brackets and tensioner already in place. With our Roll Up Door, you simply snap the brackets into the guides and the door is ready to stand. Door Springs - During production, each spring is coated with a generous amount of grease that penetrates the innermost pores of the spring with additives, displacing moisture and preventing the formation of rust and corrosion. In addition, this process relieves the friction created between spring coils, thereby providing smoother door operation. Finally, the spring and axle assembly is enclosed in a tube to protect them from the elements encountered throughout the life of the door. Package Protection and Shipping - Doors stacked on top of each other in transit are going to shift...unless they can be packaged in a way to minimize the sliding that occurs during that time. Roll Up Doors Direct has found a solution. Each door is suspended individually in the crates. Whether they travel down the block or across the country, compaction damages, door abrasions and chatter marks are virtually eliminated. Ratchet Tensioning Device - The Roll Up Doors Direct ratchet tensioning device, supplied as standard equipment on our door, offers a simpler method of tensioning while more accurately fine tuning all the springs on the door at the same time. There is no extra hardware required. Eight different positions on the tension wheel allow one to perfectly balance the door every time. There are no pins required to hold the tension on the spring...you simply just click it. Radial Ball Bearings - Roll Up Door supplies radial ball bearings at no additional cost to you. Our permanently lubricated bearings require no maintenance and are guaranteed to last the entire life span of the door. Door Stops - Our removable door stops are simple to install and prevent the curtain from over traveling the guide when raising the door. 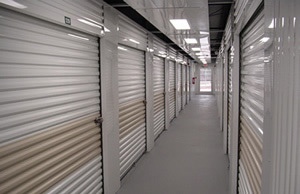 Head Axle and Torque Tube Assembly - This design, noted for its durability and smoother operation with commercial applications, has now been incorporated into the Roll Up Door self storage door. The tube housing protects the springs and strengthens the axle. Eliminating axle push and shift that can occur with a live axle, the dead axle design allows for a straighter travel path of the door curtain in the guides. The greatest feature of this design is that it affords the fine tuning of any spring adjustment to equally affect all springs on the door at the same time. Galvanized, guide-mounted Head Stops are simple to install and prevent curtain over travel when raising the door. Installed through the guide after curtain is lowered, they provide definite contact with the bottom bar angle and stop clips. The Ratchet Tensioning Assembly is factory installed on the end of the door axle and allows precise fine tuning of the initial spring tension. Increments of 1/8 turn are possible. Tensioner adjusts both springs equally at the same time from only one end of the door. Roll formed clear acrylic coated galvanized steel Bottom Bar reinforced with a 2" x 1-1/2", 11 gauge full width galvanized angle that extends fully into the guides. The PVC bulb astragal provides positive contact with floor. Lift handle(s) and stop clips installed on exterior side of bottom bar and a non-rotting pull rope is attached to the inside angle. Oil tempered helical torsion Springs are factory lubricated to minimize friction and corrosion while increasing the spring cycle life. Spring wire conforms to ASTM A 229. Galvanized and pre-painted with long lasting silicone polyester paint, the 26 gauge Corrugated Curtain is roll formed from ASTM A 653 grade 80 full hard steel. This premium steel yields greater door strength and minimized curtain damage. Full height felt tape on back of curtain prevents nesting and reduces paint rubbing. 20 colors are standard with others available on special order. Roll formed 18 gauge galvanized guides are fitted with dual polyethylene wear strips to reduce friction and muffle door noises. All guide attachment to jamb is performed through the guides without the addition of clips welded to the back of the guide. This gives a neater appearance, increased strength and aids in tight installations. Standard stainless steel cover, slide and four attachment bolts are factory installed. The slide exhibits magnetic properties that can be used to activate a guide mounted security sensor. Latch accepts all industry padlocks, including 7/16" diameter shanks. Provision for cylinder lock included. Please Note: All doors under 10' wide and 10' tall are manual lift, pull rope lowered. Commercial doors more than 10' wide or 10' tall come with a standard reduced drive chain hoist.